Reserved until April 19 ? 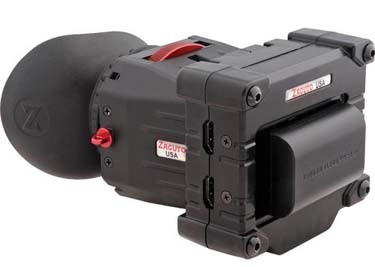 The Zacuto Z-Finder EVF Pro is a small monitor and electronic viewfinder that can be used with a Z-Finder support system. It is compatible with most DSLRs and video cameras with HDMI out. Having an offset viewfinder in front of your eye and in line with a rod-based support system allows you to shoot ENG-style for stability and comfort. The EVF also gives you better visibility to your scene in bright conditions and also aids in more accurate focusing. The included diopter allows you to use the viewfinder optically and can be snapped onto the frame of your external monitor. This Z-Finder is great for filmmakers and run-and-gun style shooting. • Do not allow sunlight to enter the Z-Finder while it is attached to the EVF. The light can be magni ed by the lens and potentially cause damage to the EVF screen. • Please see this guide for complete compatibility.